sisu: "They shall repair the ruined cities and restore what has long lain desolate"
"They shall repair the ruined cities and restore what has long lain desolate"
The Rev. 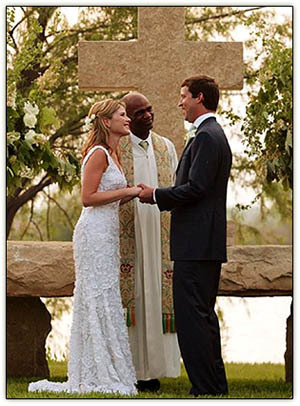 Kirbyjon Caldwell of Windsor Village United Methodist Church in Houston officiated at Jenna Bush's lakeside wedding at the President's Crawford home Saturday. In January the "longtime spiritual adviser to the president said he had decided to endorse Democratic presidential candidate Barack Obama. Kirbyjon introduced Bush at the 2000 Republican National Convention and gave the benediction at both of his inaugurations." The over-conscious Democrat president promised a cabinet that “looked like America,” but that promise didn’t hold. Contrast that with Bush’s cabinet. There’s talking, and then there’s walking. Seeing the photo [of the young couple and Rev. Caldwell, above] and reading your post reminds me of a long ago article about the two-man architectural team who designed the houses on Bush’s property. Both architects were gay, both worked and met extensively with Laura and Governor Bush — whom they described as completely gracious and welcoming, as well as completely interested in the most up-to-date methods of making their structures eco-friendly. As you mentioned: the President’s and Laura’s sense of decorum and grace is quite opposite from the Clintons’. That sounds SO George Dubya, something he would have learned at Barbara Bush's knee. "I was absolutely shocked when [Jenna] called," the affable, easygoing Rev. Caldwell told a local TV reporter. "She said 'I'm getting married, and I'd like you to perform the ceremony.' I said 'Okay. I can do that' … If you did not know that it was a daughter of a President getting married, you would not know that by being there." Watch video here. Sometimes people ask me, "Has he changed?" Well, we all change. But his core DNA remains rock-steady and virtually the same. He's the same reliable, dependable guy with a great sense of humor, who enjoys life and wants to do the best he can as president of the United States. In fact, he told me last week he's gonna work until his term is up. He is not going to be a kick-up-your-boots on the desk second-term president. He wants to do what the people have elected him to do. Over the years, they became friends, even though Caldwell is not a Republican. Why? Both are Texans. Both are Methodists. Both earned MBAs from renowned business schools. And both have a passion for faith-based programs. Beyond that, they both are known as straight-shooting CEO types who don't get tangled up in a lot of introspection. His five-year study shows that immigration and ethnic diversity have a devastating short- and medium-term influence on the social capital, fabric of associations, trust, and neighborliness that create and sustain communities. He fears that his work on the surprisingly negative effects of diversity will become part of the immigration debate, even though he finds that in the long run, people do forge new communities and new ties. One of the major themes of Caldwell's preaching has been the need for his congregation to follow Jesus Christ's lead by being actively involved in community service [akin to the Catholic Church's "subsidiarity"?]. Taking the lead, Caldwell has transformed the Windsor Village United Methodist Church into an all-purpose community help center … The mission of the Power Center is to create jobs in the low-income neighborhood and to teach members of the neighborhood how to create wealth. The Center's motto is from Isaiah 61.4: "They shall repair the ruined cities and restore what has long lain desolate." What a breath of fresh air compared to Barack Obama's lately spurned spiritual mentor, the "audaciously hopeful" Jeremiah Wright, with his "Black Value System" and "disavowel of 'middleclassness,' a selfish pursuit of money and status without giving back to the larger black community." 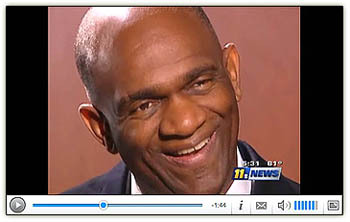 Kirbyjon Caldwell's can-do spirit puts the lie to Rev. Wright's willful misreading of the legendary generosity of middle-class America, black or white. Thanks for a view of President Bush that explains the sincere person that he is. A view that the MSM is totally unaware of. Those who have met his mother can see her beneficent influence clearly in the son. And GWB's daughters are clearly the result of extraordinary parenting from mother and father. Okay - I got off track during the recent period of unsatisfyingly temporary jobs (too depressed to think about planning intelligent meals) but the one thing I did do throughout the period was to cut off all eating about 4 p.m. daily - even on weekends. That way I felt in no way confined during the day, and yet went to bed without a load of food in my stomach which actually led to me sleeping more soundly. Now that I'm back on the full time, well paid grind (not really such a grind given how great this job really is), I have decided to print out the entire Cold Turkey Cookbook and go for it! Here's another tip for those who tend to eat lunch at their desks (as I do): Put it on a nice plate if you can and eat your lunch with deliberation and maximum enjoyment. And I make every effort to take at least 20 minutes where I'm not cranking out documents. My trick is to buy really pretty single plates at garage and yard sales (seldom paying more than 25 cents and usually more like 10 cents) and using them at the office. If they get broken, not a huge loss. But they make eating lunch at your desk much more satisfying! I also cook ahead on weekends so that there's no excuse for me not bringing my lunch. Hopefully this too solid flesh will begin to melt away again! It's really interesting to read about Bush in this light. He is indeed "colorblind". But did it really help all of us, really? In the big scheme of things, no. My friends, family embrace the greatness of what is happenning in this country. Obama rocks.